A good monsoon led to a rise in sowing and production of pulses in 2017, resulting in prices falling almost by half. Earlier, in 2015, rising prices causing declining consumption of pulses had been a cause of concern for both nutrition and food inflation in policy corridors. For a long time, India’s pulse production had been nearly stagnant, but volatility in prices and production in recent years make the continuing growth in pulses a big challenge for researchers, extension agencies, and policymakers. Pulses are mainly produced by small farmers on marginal lands and face abiotic stresses like moisture, drought, and elevated temperature as well as biotic stresses like pests. This often leads to huge losses, reducing production by up to 20 per cent. 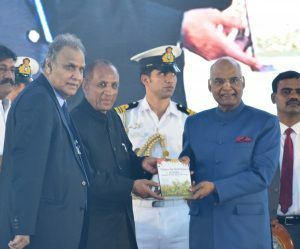 The green revolution pushed pulses away from irrigated areas, with nearly 87 percent now being grown in rainfed areas. Despite their importance to diet and nutrition in India, yield improvement and technology development has been far more extensive in cereals vis-à-vis pulses. In light of these challenges, the International Food Policy Research Institute (IFPRI), supported by the CGIAR Research Program on Agriculture for Nutrition and Health (A4NH), is releasing a comprehensive book - Pulses for Nutrition in India: Changing Pattern from Farm to Fork authored by Devesh Roy, P K Joshi, and Raj Chandra – in the inaugural session at 100th Annual Conference of the Indian Economic Association on December 27, 2017 at Acharya Nagarjuna University, Nagarjuna Nagar, Guntur, Andhra Pradesh. 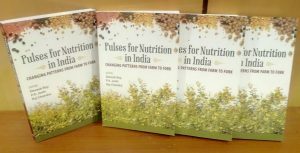 The eight chapters in the book cover the journey of pulses across the value chain, from understanding final demand and supply, production, consumption, prices to trade, technology, processing, markets and government interventions. Technology delivery systems need strengthening by linking formal and informal seed sectors and motivating seed companies to engage in pulse seed programs. Utilization of rice-fallow lands for pulses can be important. Up to 3-4 million hectares of rice-fallow lands are spread across Bihar, Chhattisgarh, Jharkhand, Odisha, and Madhya Pradesh. During the winter (rabi) season, farmers can grow pulses using residual moisture – lentils in upland and chickpeas in medium and lowlands. Pulse processing is characterized by with low efficiency, irregular operation and inadequate capacity utilization. If processing were to become the engine of growth for pulses, there must be a structural shift toward larger mills with regular supply of good quality pulses. To develop infrastructure such as irrigation, transport, and communications in developing and deepening pulse markets. The participation of the private sector in research and seed value chain needs to be expanded. Incentives need to be put in place for private enterprises to engage in nutrition-sensitive food innovations; these may come in the form of research, tax, credits, challenge grants, or other strategies. This press release also appears on www.ifpri.org. For additional information, please contact Jyotsana Dua or Drew Sample.